We are not impressed by someone’s ability to intimidate, cajole, persuade, manipulate, overpower or overwhelm others. No, what impresses us most are the people who have the ability to do these things, but who choose instead to let kindness lead them to success. Once upon a time, a colleague of ours — frustrated by an assistant who couldn’t move as fast as he wanted — pulled her into his office and unleashed five minutes of verbal abuse before he fired her. She ran out in tears, and he came out with a big smile. “That felt SO good,” he said. He viewed this incident as a success. We saw this as evidence that he was kind to people only as long as they did exactly what he asked. Otherwise, he cared not one whit about them. It’s easy to yell and threaten, but these behaviors are signs of weakness, not strength. Strong people don’t lose control of their emotions. Skilled fighters say that once you lose your temper, you have lost the fight. Your vision narrows and you become dangerously impulsive. If losing your temper is a weakness for fighters, it is a deadly flaw for professionals. You don’t have a choice whether or not: the economy tanks, the stock market soars, your company is bought, your job is threatened, the biggest jerk in the world is promoted to be your boss, your best friend questions your ethics or your significant other truly loves you. You only have a choice how you respond to such events. To the degree that human beings have power, that power lies in our response. Sure, you can initiate change. But that’s the easy part. You decide to donate $50 to a charity like you have every year for the past ten. You sit down and write a check, then mail it. Easy-peasy. But then you lose your job. Do you still donate $50 to charity? Maybe yes, maybe no. Perhaps you give them a week of your time instead… that would be a good outcome. Maybe you ignore their needs because you are too stressed out… that would be a bad outcome. Kindness fosters more kindness. It opens eyes instead of closing them. It is contagious, and it feels wonderful. Kindness does NOT equal weakness. Quite the contrary. It takes tremendous strength to be kind to someone who is slowing you down or who thinks differently than you do. But kindness bridges such gaps, and brings out the talent hidden in so many people. Luis Benitez, who has 32 times summited the Seven Summits — the tallest mountains on each continent — told us that kindness and compassion are essential elements to overcome the horrible physical and mental challenges he encounters while climbing. For example, if you see someone limping on a day when you have to reach the next camp, you can curse their weakness and ignore their pain, or you can stop for 20 minutes and bandage their feet so they can keep up with you for the rest of the climb. By the way, that second strategy is not entirely altruistic. If a member of your party loses the ability to hike, your group may have to turn around. Stopping to help a colleague may be the fastest way to ensure you achieve your goals. 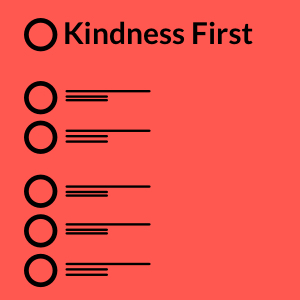 Each day, in the #1 slot on our To Do lists, we place “Kindness First.” Before we do anything else, we take at least one action that has no purpose other than to be kind to another person. Kindness First is the single best way to connect with other people and to lift my own spirits. The more unexpected my kindness, the more satisfaction we experience when offering it. If this sounds like some sort of overly altruistic endeavor, we would like to confess that, to us, this Kindness First strategy is one of our most selfish practices. By reaching out to other people every single day, we strengthen our social networks and — in effect — take out an insurance policy on our health and longevity. The stronger your social connections, the happier and healthier you are likely to be. In our experience, strong social connections don’t come from asking people favors or manipulating them to get what you want. They come from being genuinely interested in other people, and from having an authentic interest in their well-being. It comes from being willing to help others. It comes from giving of yourself.